Its very rare to come across a talk that is so original and yet so firmly footed on facts. Shir Hever looks at the occupation with the cold precision of economics, that then leads to some startling conclusions. One conclusion [ours, not necessarily the speakers] is that it was the Palestinian resistance through its Intifada's, through its use of violence against the occupier, that turned the occupation from being a major money maker for Israel, into an economic liability due to the skyrocketing security costs the occupation now exacts (which together with the much smaller cost of bribing colonists to stay on stolen land) means the occupation costs Israel $9 billion a year and increasing at a rate of 7% per annum. 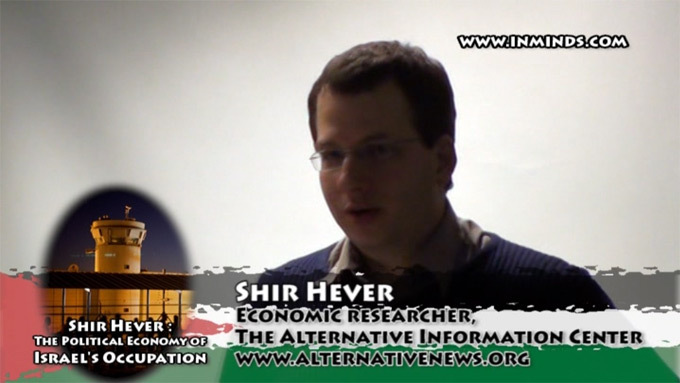 Shir Hever is an economic researcher in the Alternative Information Center, a Palestinian-Israeli organization active in Jerusalem and Beit-Sahour. 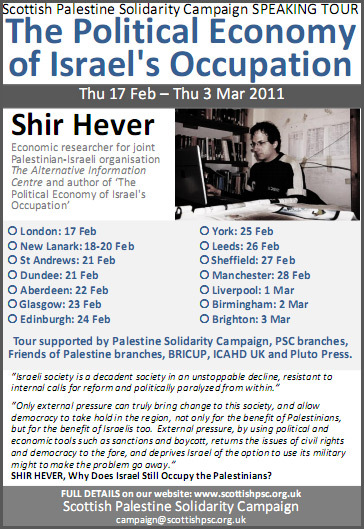 Shir Hever specialises in researching the economic aspect of the Israeli occupation of the Palestinian territories. 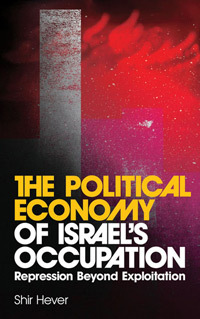 He is author of recent book 'The Political Economy of Israel's Occupation'. 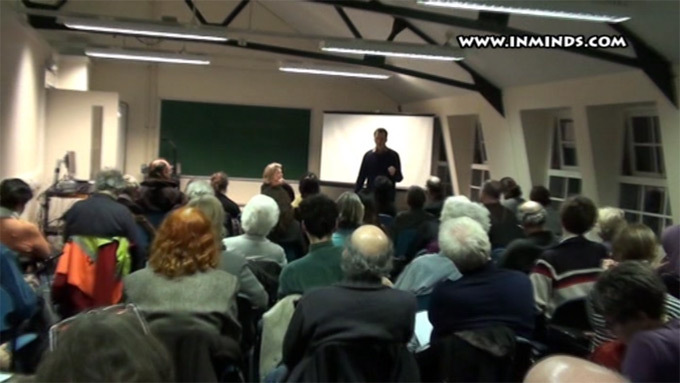 The Scottish Palestine Solidarity arranged a speaking tour for Shir Hever of 14 cities in the UK. The first stop was at Kings College London on 17 February 2011, organised by Kings College Action Palestine, Palestine Solidarity Campaign and BRICUP. This report is from that talk. 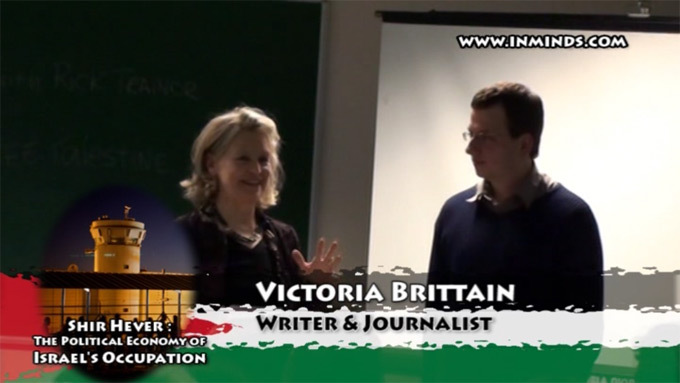 The event was chaired by acclaimed writer and journalist Victoria Brittain. Shir Hever spoke for about 40 minutes followed by 70 minutes of questions and answers. The full video of both the talk and q-a session is included below. Shir Hever's started his talk by explaining the words in the title of his talk. He defined what he meant by 'political economy' : "the idea is that we try and understand political reality through understanding the material interests that help to form that reality". He also explained that whilst by "occupation" he was focusing on the West Bank and Gaza in this talk, its important to remember that "the occupation spreads deep in to every aspect of Israeli society". As for the word 'Israel' he explained that also meant different things. He explained that the conditions of Israel joining the OEDC (Organisation of Developed Countries) was to submit economic data just for Israel, it ignored that condition and included the West Bank and Gaza as an integral part of Israel, but left out any reference to the Palestinians. Similarly with the Beduins: "Even the Bedouin communities that live in the Negev, the south of Israel - that's supposed to be part of Israel, and yet the Israel government treats the Bedouin who live there as intruders as if they are foreigners that occupy Israeli land. Israel is trying to ethnically cleanse these communities. The most famous and most recent issue is the village of Al-Arakib which has been demolished 18 times [as of 17 Feb 2011] by Israeli forces, and the residents keep rebuilding their homes again and again." 1. "What is the role of the international community, especially through aid - though money - that is being spent on this territory. Aid to the Palestinians, aid to Israel. And who is actually paying for the occupation. And the follow up question - why? Why is the international community spending so much money?" 2. "What about the cost of the occupation. Is the occupation actually profitable for Israel - for the occupiers? And since my answer is actually no its not profitable, and I'll explain why, the follow up question is in that case why does Israel continue to occupy? 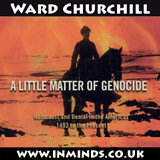 Why doesn't Israel withdraw?" 3. "Why is Palestine so important?" Under international law the occupier is responsible for the well being of the occupied population. Israel is responsible for the well being of the Palestinian population therefor any aid to the Palestinian population is actually aid to Israel, its a gift to Israel. The European union made a strategic decision, they believe in a two state solution that a two state solution is in the interest of the European Union and the way to achieve that is to try and create the economic foundations of a Palestinian state by sending aid. The aid is classified under two different ways, you can either have development aid or humanitarian aid. Obviously donors prefer development aid because they are trying to create infrastructure so that the Palestinians will have a viable sustainable state. But what we see in reality was that this development aid was a failure. Between 1994 and 2000 about $7 billion worth of development aid alone were invested and were not able to achieve any improvement in the standard of living of Palestinians in the Occupied Territories, for a lot of reasons, mainly because the Israeli authority prevented projects from succeeding by putting numerous bureaucratic and other kinds of obstacles and kept raw materials from reaching their destinations and kept workers from reaching the workplace. And when the second Intifada started in 2000, the donors reacted by shifting from development aid to humanitarian aid. This shift continues largely till today. There is more humanitarian aid than development aid. More food, medicine, emergency support just to keep the population from a humanitarian catastrophe and very little in the way of developing Palestinian economy. And this happens to be also Israels interest. This happens to be exactly what Israel wants, because humanitarian aid takes responsibility of Israels shoulders and is also a source of profit for Israeli companies. Lot of the food that is bought by the United Nations World Food Programme, by Oxfam, by the Red Cross and shipped to Palestinians is bought from Israeli companies because the customs situation that Israel has created with the Occupied Territories makes it cheaper and easier for the aid agencies to buy Israeli products than to import food which is actually cheaper in Jordan and Egypt. But if they import it from there then they have to pay customs to Israel, which is another source of profits for Israel, therefor they just buy from Israeli companies. They also have to use Israeli transportation companies and pay various taxes and most importantly they use Israeli currency for everything. Palestinians don't have their own currency, therefor all of the transactions that aid agencies do, they do with Israeli currency. Then what you actually see is that the occupation became one of Israels biggest exports! Its an export because Israeli companies provide services to international companies. The international companies pay with foreign currencies which is converted in to Israeli currency. the foreign currency stays in the vaults of the Israeli central bank, the local currency is being used locally and the Israeli companies profit. That works without creating any competition for the Israeli companies because the Palestinian economy doesn't develop, because the development aid has largely been forsaken. So thats one issue - who pays for the occupation? Much of that cost falls on the shoulders of the international community, much of that cost is payed by Europe and on the other hand by the United States which pays for the ammunition and guns that are used in order to repress Palestinian resistance. The European Union has so far refused to adopt any kind of policy that puts sanctions of Israel or demands accountability from Israel - they are only willing to use carrots but no sticks. Even though they are fully aware that all the aid they are giving to the Palestinians, actually ends up, not all of it but a large part, ends up in the hands of Israeli companies and the Israeli government, they continue to extend these projects year after year because they are not willing to take any kind of impunitive act and dare stand against the United States and suffer the anger of the United States. According to what I said so far you can get the impression that occupation IS profitable to Israel because the international community pays so much money and so much of it ends up in the hands of the Israeli government and the Israeli companies. And actually when we look at the first 20 years of occupation, the occupation was indeed profitable for Israel for lot of reasons - their exploitation of cheap Palestinian workers, cheap Palestinian labour, exploitation of Palestinian natural resources especially agricultural land and water, and the exploitation of the captive Palestinian market. If you go to a supermarket in the West Bank, still today, you will see most of the products are in Hebrew - most of the products are imported from Israel because Israeli companies have unlimited access while importers find it much more difficult to bring in products to the Palestinian market - they have to pay customs and so on, and they have to go through checkpoints. And Palestinian producers themselves find it very difficult to produce under the limitations set by the Israeli government, that creates an advantage for Israeli companies. In fact in the first years of the occupation, the Israeli military government of the occupied territories collected taxes from the Palestinians, like Israel collects taxes from its own population, but only some of these taxes were invested back in to the Palestinian economy, whist some of that money was actually instead transfered to the Israeli ministry of finance - the most direct kind of theft you could envision. But that started to change. It started to change for two reasons. There are two kinds of cost to the occupation that we should look at. First of all is the civilian cost. The civilian cost is what Israel pays in order to encourage Jewish colonists to colonize the West Bank. And that means benefits in housing - on average 50% of the cost of a house in the occupied territories is subsidised by the government, for Jews only of course. Subsidised transportation, special roads that are paid for the colonists, colonists pay less taxes than other Israeli citizens. They receive more public building, therefor more public jobs as well - more jobs in the public sector which creates employment in the colonies. All these are summed up to be quite large subsides at about 3 billion dollars annually in todays terms. But the bigger cost is actually the cost of security. And that is the reason why the occupation ceased to be profitable after about 20 years when the first Intifada started. And when the Palestinians started to organise their rebellion against the occupation, the Israeli government had to increase the number of soldiers stationed in the occupied territories by a factor of 10. And all the soldiers had to be equipped with special armour and better equipment, better guns and so on. Fences were erected around the colonies, security cameras were set up everywhere, and thats the cost of security. Of course the wall of separation which is the most visible aspect of security in the occupied territories is a very expensive project - so far it costs nearly 5 billion dollars - just the wall of separation. The biggest part of the cost of security, more than everything I've mentioned so far put together, is the cost of internal security. Its the cost of having security guards stationed inside Israel at the entrance to every shop, armed guards on buses, and prisons for housing approx. 11,000 Palestinian political prisoners at any given time - these prisons cost a lot of money. All these expenditures amount to 6 billion dollars annually in todays terms. So all together, $3 billion civilian cost and $6 billion security cost, the cost of occupation is 9 billion dollars all together every year. That above 9% of the total budget of the Israeli government. And the rate of growth of the colonist population is about 7% every year (due to immigration). So many people immigrate in to these colonies because of all the subsidies, and then the government spends more money on these subsidies - its a kind of snow ball. And because of that snow ball the cost of occupation increases by approx. 7% every year, whilst the total Israeli budget growns by 2.5% every year. By that calculation we can imagine a future in which 50% of the Israeli budget would just be to maintain the occupation by the year 2038! The talk was followed by over an hour of questions and answers. As with the main talk, the question and answer session revealed so many interesting facts, for example did you know that Israel takes about $1000 from every aid truck for the right to pass to Gaza?